GRACE BAY was recently awarded The World's Leading Beach Destination at the World Travel Awards and Top Beach Destination in the world. The CALABASH SUITE is located directly on Grace Bay Beach at ROYAL WEST INDIES RESORT, and considered to be one of RWI’s finest suites – 12 miles of pure white powdery sand and stunning turquoise waters await directly in front of your suite …… and the Island’s best shopping and restaurants, just a short walk away ….… It doesn’t get any better! Royal West Indies Resort is an upscale beachfront development, renowned for it's lush tropical landscaping and traditional British West Indies design. This spacious suite is situated on the 2nd floor of the beachfront building and offers spectacular panaromic views of the pristine white beach and turquoise waters beyond ..... and every evening you will enjoy dramatic sunsets over Grace Bay from your private beachfront terrace. This luxurious condominium offers over 1000 square feet of elegant living space, featuring upgraded Caribbean inspired furniture, a spacious living area directly overlooking the beach and large sliding glass doors opening onto an over-size wrap around oceanfront terrace. The master bedroom is bright and airy with it's signature Caribbean louvered shutters and also features beach and ocean views. The suite also has a fully appointed kitchen with upgraded SS Appliances, Dishwasher, Ice-maker, R/O purified drinking water, breakfast bar and dining area. The Suite accommodates up to four people in comfort, with a luxurious king-size pillow top bed in the master bedroom and a comfortable queen-size sofa bed in the living room. The Calabash Suite is a full one bedroom suite, with a separate and private master bedroom, double the size of standard RWI units. This suite comes fully equipped with all the comforts of home and has many upgraded features not found in typical rental pool units. This suite is one of only 4 very special suites at RWI located directly on the beach and on an upper floor of the beachfront building ...... offering you the absolutely best beach and ocean views in the entire resort by far .... Guaranteed !!! • 48" HD TV in living room and 32" HD TV in bedroom. • And best of all ...... you know exactly which suite you are renting ...... one of Royal West's finest suites! 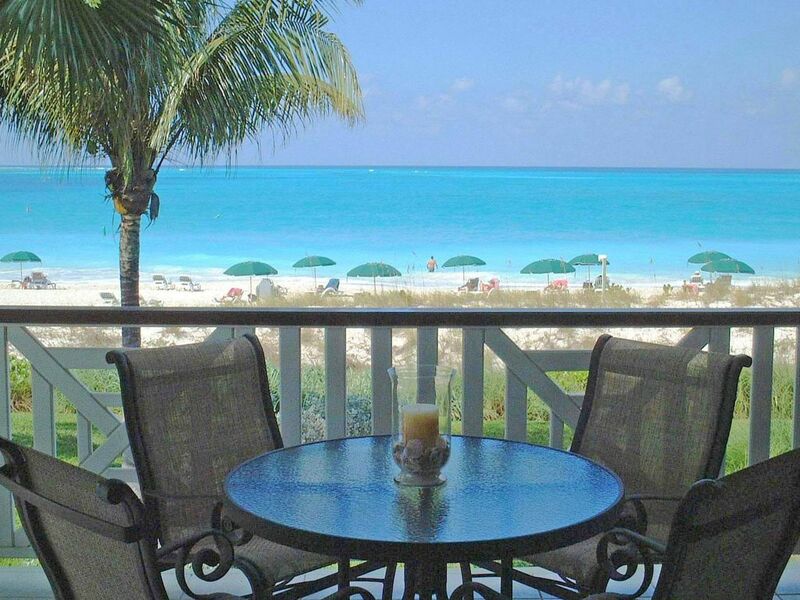 OWNER MANAGED ....... Our owner direct management and 18 years of vacation rental experience on Grace Bay ensures you will receive the very best value, personalized service, and a superior vacation rental experience. Our owner direct management and 18 years of vacation rental experience on Grace Bay ensures you will receive the very best value, personalized service, and a superior vacation rental experience. The very best suites at Royal West Indies Resort are the Premium 1 bedroom suites located on the 2nd and 3rd floors of the beachfront building. These suites clearly offer the very best unobstructed beach and ocean views in the entire resort from their wraparound oceanfront terraces, without any sand dunes, vegetation or other buildings blocking your views. The Calabash Suite is one of only 4 Premium beachfront suites offering these magnificent views …… plus ocean views from every room in the suite as well. Our many returning guests consider The Calabash Suite to be one of the very best suites at Royal West Indies Resort. Also when booking The Calabash Suite, you know exactly which suite you will be staying in, rather than being assigned just any suite upon arrival. Great location with lots to do. Easy walk to the beach and not crowded at all. Unit was immaculate and well kept. Easy to cook you own meal there with a complete set of appliances. Definitely the ultimate place to relax. Perfect location - Awesome stay! Our family had a wonderful time on TCI and staying at the Calabash Suite was a great part of the delightful experience. This was our 6th visit to Provo and we’ve stayed at various resorts and villas but our first time at the Royal West Indies Resort. Nothing tops a beachfront view that’s so close to the water you hear the waves crashing yet with just the right buffer from noise and activities. The Calabash Suite was clean, fully operational and well equipped…just what one needs when setting out on vacation. The instructions and guides were also very clear and helpful. The parking tip was key to a short walk to the suite. We'll be back for sure. We had an AMAZING week in the Calabash Suite. The condo was clean, comfortable and spacious enough for our family of 4. The views off the balcony were amazing. The resort was not only in a perfect location, but also very well kept and accommodating with a friendly, helpful staff. We enjoyed the Pelican Bay Restaurant for the lobster extravaganza and seafood galore nights-delicious!! They put on a great beach party for NYE as well. The beach was beautiful-soft sand and crystal blue waters like we’ve never seen before! We can’t wait to return! Beautiful accommodations, wonderful resort, super nice staff and absolutely amazing beach and water! Really couldn’t ask for more. Maybe a few boardgames like backgammon or something for the evenings you choose to stay in. Between What the owner supply’s and others leave behind, there’s plenty of the necessities covered! No need to bring books either, tons to choose from in the condo. Pelican Bay Restautant- Lobster Night on Wednesday (All you can eat). Yummy!! Take Ferry to North Caicos, rent a jeep from Superior Rentals and your Norrh and Middle Caicos, especially Mudjjn Beach & Restaurant adjacent to Dragon Cay Resort. You won’t be disappointed! I could go on and on but I think you get the picture that you will have an amazing time! It was perfect, no other words needed. It was effortless to be in the condo, everything was wonderful. Thank you for a great place to call home for a week. Amazing condo, location, view....Everything was perfect!! Royal West Indies, building 1, unit 125 is simply amazing!! This was our 5th visit to Royal West Indies, and our first in this unit, it will not be our last!! This unit has everything needed for a perfect vacation! Breakfast and lunch on the balcony, a fully equipped kitchen with filtered water and a great blender for frozen drinks! Bed is super comfortable, and mid week maid service was great! You will not be disappointed in this unit! We will be back! Andrew was great to work with, quick to answer any questions, and easy instructions!! Thanks so much!!! Royal West Indies Resort is centrally located directly on Grace Bay Beach within walking distance of Regent Village, Ports of Call Mall, Salt Mills Plaza, IGA Gourmet Grocery, Casablanca Casino and the Island's best restaurants and bars. At the resort you will also find The Pelican Bay Restaurant & Bar.